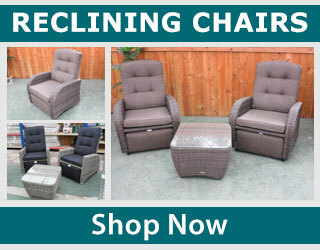 Our reclining rattan garden furniture is available online today, with UK home delivery on our chairs, sofas, and sets. Imagine reclining back in your very own reclining garden chair on a summers afternoon, sinking deeply into the extra thick cushioning, drifting back without a care in the world, the sun gently warming your face. This is the ULTIMATE relaxation furniture, allowing you to truly indulge in the perfect luxury set, without breaking the bank. Reclining garden furniture is all weather, meaning you won’t have to cover it or store it, it can be left outside all year. This is because the hand woven rattan is UV stabilized, and so won’t break down in the sun, plus the frame is made from strong aluminium which cannot rust, letting it survive the snow and ice of winter. You can buy reclining chairs, sofas, and reclining furniture sets online today, with our outdoor range available for UK home delivery. If you have any questions about our reclining furniture please don’t hesitate to contact us.